The first jet-powered ‘cat’ to be produced by Grumman and the first carrier borne jet to get into combat, the F9F Panther performed Korea where it constituted the back-bone of US Navy and US Marine Corps air power, and by the time production ceased in late 1952 close to 1,400 had been built. 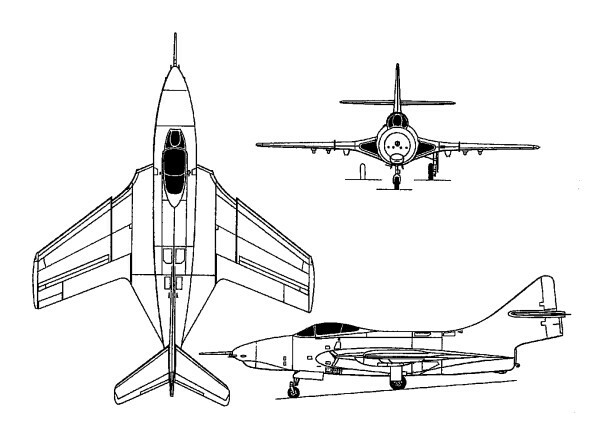 The Cougar was a swept-wing development of the earlier G-79 Panther. The fuselage was similar but the wings and tailplane were swept at 35 deg. 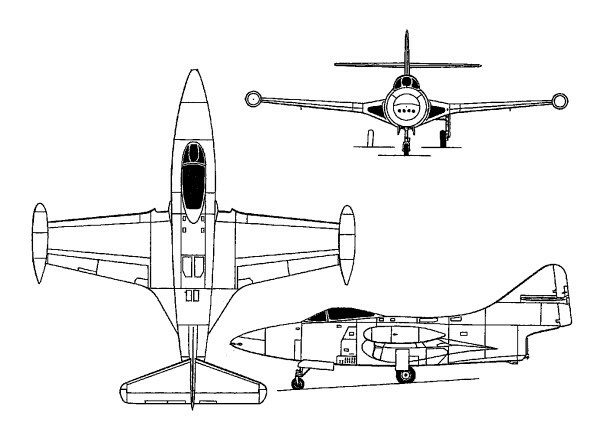 The original layout of this single-seat carrier-based fighter provided for the installation of four wing-mounted Westinghouse 19XB-2B (Navy J30) axial-flow jets. But this arrangement was abandoned in favour of one fuselage-mounted high-powered turbojet engine before prototype construction began, a change prompted by the successful tests conducted by the Navy in December 1946 with two imported Rolls-Royce Nene engines. Grumman then turned its attentions to a single-seat single engine jet day fighter, two prototypes duly being ordered with the designation XF9F-2. Powered by an imported Rolls-Royce Nene engine, the first of these made its maiden flight on 24 November 1947 and such was the promise shown that substantial orders were soon forth-coming for production-configured F9F-2 aircraft fitted with the licence-built Pratt & Whitney J42 copy of the Nene turbojet. The second prototype was similarly fitted, but the third (the XF9F-3) had an Allison J33 engine. Production aircraft were divided between Nene and Allison-powered models, the former engines licence-built by Pratt & Whitney as J42s. The first production F9F-2, powered by a 22.24kN J42-P-6, flew for the first time on 24 November 1948. The 20.46kN J33-A-8-powered prototype flew for the first time on 15 August 1948 and a total of 418 of both versions were built. However the F9F-2 proved to be the better version and the F9F-3s were re-engined to F9F-2 standard. Although the F9F-2 was the initial production model, the honour of being the first variant to enter service fell to the F9F-3, which used the slightly less powerful Allison J33 engine. This joined US Navy Fighter Squadron VF-51 during May 1949 but in the event only 54 F9F-3s were completed, most being modified later to F9F-2 standard. The next version to appear was the F9F-4 (73 of which were ordered originally) with the Allison J33-A-16, but none was completed and the contracts were combined with those for more than 580 27.80kN Pratt & Whitney J48-P-4/6A-engined F9F-5s (which flew for the first time on 21 December 1949). The most prolific variant was the F9F-5 which was powered by the Pratt & Whitney J48, a licence-built Rolls-Royce Tay, and over 600 were completed by the time production ceased at the end of 1952, this total including a small number of F9F-5P aircraft for photo reconnaissance duties. The F9F-5 was the last version to see squadron service, being finally retired by VAH-7 in October 1958, although many Panthers continued to fly after that date with training units, and as F9F-5KD (from 1962 DF-9E) drone targets and controllers for missile trials. The F9F-4 was powered by an Allison J33-A-16 engine. The F9F-5P was a photographic-reconnaissance version with a longer camera nose. First flown in prototype form as the XF9F-6 on 20 September 1951, the Grumman F9F Cougar evolved from the earlier F9F Panther series of fighter aircraft. It differed mainly from its predecessors by virtue of possessing swept wings and tailplane, thus earning the distinction of being the first swept-wing carrierborne type to enter service. Apart from this, changes were kept to a minimum to facilitate rapid production. Indeed, the new Cougar entered service just 14 months after its maiden flight took place, initial examples of the 32.25kN Pratt & Whitney J48-P-8-engined F9F-6 (later designated F-9F) joining VF-32 of the Atlantic Fleet naval air force during November 1951. Although the F9F-2 was the initial production model, the honour of being the first variant to enter service fell to the F9F-3, which used the slightly less powerful Allison J33 engine. This joined US Navy Fighter Squadron VF-51 during May 1949 but in the event only 54 F9F-3s were completed, most being modified later to F9F-2 stan-dard. The next version to appear was the F9F-4 (73 of which were ordered originally) with the Allison J33-A-16, but none was completed and the contracts were combined with those for more than 580 27.80kN Pratt & Whitney J48-P-4/6A-engined F9F-5s (which flew for the first time on 21 December 1949). The F9F-2, -3, -4 and -5 were in service in 1955. The most prolific variant was the F9F-5 which was powered by the Pratt & Whitney J48, a licence-built Rolls-Royce Tay, and over 600 were completed by the time production ceased at the end of 1952, this total including a small number of F9F-5P aircraft for photo reconnaissance duties. F9F-5P is long-nosed photo-reconnaissance version. Later machines can be seen with flight refuelling nose-probe. Shortly after this deliveries to Pacific Fleet units got under way, and the type was very soon introduced to combat in Korea. Production of the F9F-6 totalled 706 aircraft, 60 of which were completed as unarmed F9F-6P machines for reconnaissance duties with a longer nose to accommodate K-17 and trimetrogon cameras, and these were followed by the F9F-7 (F-9H) which was powered by an Allison J33-A-16A turbojet. This proved to be only a temporary change, and after completing 168 F9F-7s Grumman reverted to the Pratt & Whitney J48 engine for the F9F-8 (which bore the Grumman design designation G-99) (F-9J), which became the definitive Cougar, well over 1,000 being completed in three basic variants. First to appear was the F9F-8 (601 built). Movable leading-edge slats were replaced by fixed cambered leading-edge extensions outboard of the wing fences. Total internal fuel capacity was increased by 530 litres. Large numbers were later modified to F9F-8B (AF-9J) standard with provision for air-to-surface guided missiles. The first production F9F-8 flew on 18 January 1954. Some 110 of a photo-reconnaissance version designated F9F-8P (RF-9J) flew for the first time on 21 August 1955 and had an extended nose for the cameras. The Cougar also lent itself to the training of future naval aviators; a prototype two-seat YF9F-8T first flown on 4 April 1956 was followed by 399 F9F-8T (TF-9J) production examples, some of which remained in use with Naval Air Training Command until well into the 1970s. The F8F-8T was armed with two 20mm cannon and was 23 inch longer than the original cougar. Production of this version ended on the last day of 1959. As far as front-line units were con­cerned, the Cougar disappeared from the scene early in 1960, the last oper­ational version being the F9F-8P, but many continued to fly long after that date with the Reserve Force and with Air Training Command. Surplus air­craft became F9F-6K (QF-9F) and F9F-6K2 (QF-9G) target drones or F9F-6D (DF-9F) drone directors. Panthers are remembered for recording a victory against an enemy jet aircraft, a MiG-15, on 9 November 1950. Wing area 23.23 sq.m (250 sq ft). Armament: four 20-mm cannon, plus up to 1361 kg (3,000 lb) of external ordnance. Loaded weight: approx. 20,000 lb. Engine: Pratt & Whitney J48-P-6A, 6,250 lb (2 835 kg). Engine: Allison J33-A-16, 6,250 lb (2 835 kg). Engine: one 3289-kg (7, 250-lb) thrust Pratt & Whitney J48-P-8A turbojet. Wing area 31.31 sq.m (337 sq.ft).